A row of houses in Camden, New Jersey, where 2 out of every 5 residents lives below the poverty line. 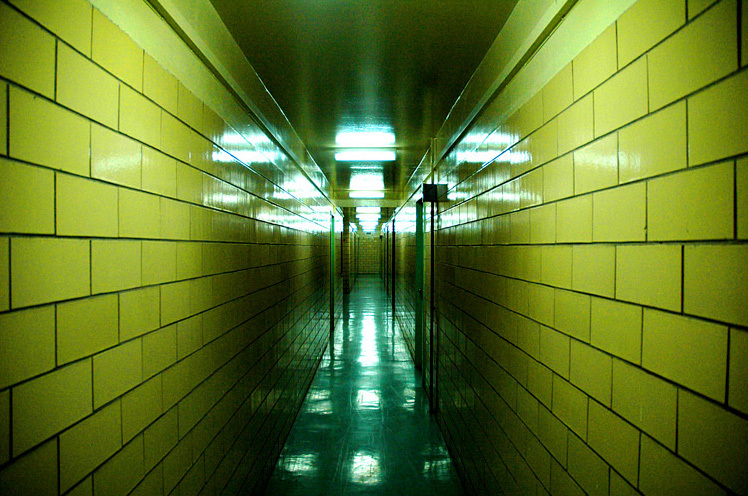 Above: A typical corridor of public housing projects in NYC. These projects are known to have rampant mold and moisture problems, along with asthma and crime. The challenges of poverty infiltrate all aspects of well-being, including access to adequate housing, clean water, waste disposal, a variety of nutritious foods, recreational activities, education and healthcare. Globally, we often think of those living in slums and informal urban settings as those who are most affected by conditions of poverty. But we needn’t go as far as the favelas in Brazil or the crowded cities of India in order to find poverty. In Canada, 1 in 6 children live in poverty; in the US, over 20% of children under the age of 18 live in households with incomes below the poverty line. Even in developed countries, conditions of poverty and low income can restrict or even deny access to the essentials required to maintain a healthy household. How are we to think of the relationship between poverty and health? Might it be possible to treat poverty itself as an illness, exhibiting symptoms that inhibit health? Dr. Gary Bloch is a Canadian family physician at St. Michael’s Hospital and an Assistant Professor at the University of Toronto. His priority is working with patients who live in poverty and those without adequate housing. Interviewed on CBC Radio’s The Current, Dr. Bloch discussed the importance and the challenges of his work. “Poverty is almost certainly the biggest determinant of health in our society,” Dr. Bloch states. People who are healthy but fall into poverty are more likely to develop different types of chronic disease, and living in poverty with these illnesses “results in worse outcomes, higher chances of being hospitalized, higher chances of severe complications, higher chances of dying.” Especially at the lower end of the income scale, Dr. Bloch states that poverty supersedes all other determinants of health, including genetics or quality of healthcare received. Dr. Bloch and his colleague, Dr. Julia Morinis, a pediatrician at St. Michael’s Hospital and The Hospital for Sick Children in Toronto, emphasize that until doctors deal directly with the poverty of their patients, the health of their patients will not improve. Dealing directly with poverty includes screening for social issues, hearing the stories and experiences of patients struggling with poverty, and asking questions. It involves advocating for immigration status in some cases, helping patients gain access to legal assistance, encouraging them to do their taxes and helping them determine their eligibility for social assistance support. In addition to the struggles individuals and parents may face, conditions of poverty may inhibit the healthy development of children. Dr. Morinis emphasizes that the early years of a child’s life are the most important for setting that child’s health trajectory, and thus intervention before the age of 6 can improve health and well-being outcomes later in life. Public housing projects in NYC. The average annual household income for residents in public housing falls well below the federal poverty line. Further, this intervention cannot only happen at the household level. A study published in American Psychologist in 2012, “The Effects of Poverty on the Mental, Emotional and Behavioral Health of Children and Youth” (Yoshikawa et al), presents a model that incorporates factors of poverty at three levels: the individual level, the relational level and the institutional level. That is, factors such as stress, nutrition, quality of inter-personal relationships and school environments contribute to conditions of poverty. Thus, improving these conditions includes not only increasing income, but improving the greater social community that households are a part of and have access to. If living conditions are extreme, treatment for a specific illness may only improve health temporarily. To treat illness in isolation of and independently from determinants and conditions of poverty misses the opportunity to improve well-being in the long run, in a more permanent way, in both developing and developed countries.